Last November I was given two new lines of Switch sunglasses (the Stormriders and the Pathfinders) and both have fixed lenses but allow you to interchange the eyecups, the soft rubber, closed-cell cushions that surround the lenses. Each came with two different types of eyecups – the Activity Guards, which the company says “screens out mild debris and wind” and the Climate Guards, which provide “a goggle-like fit with its thin, ultra flexible TPR rim for maximum blockage of debris, wind, water and other elements. The idea being that you can skin up while wearing your glasses and then pop in the magnetized Climate Guard eyecups for the ski down – no need to pack in a bulky pair of goggles. I have to admit I liked the idea but I was also skeptical: was this going to be yet another gimmick in the world of sunglasses or had Switch Vision created yet another successful product? 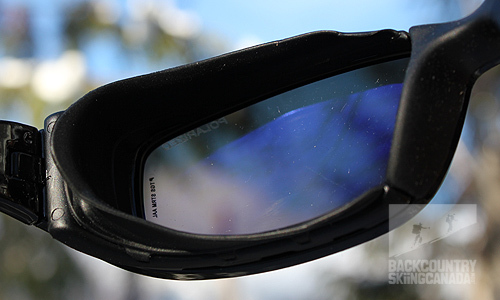 You can see the climate guard eyecups installed on the Pathfinder sunglasses. 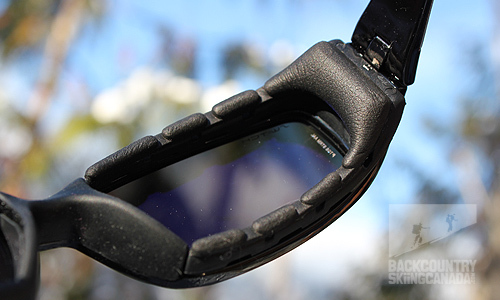 The climate guard eyecup has strategicaly placed venting and of course an embeded magnet to secure it to the Pathfinder sunglass frame. 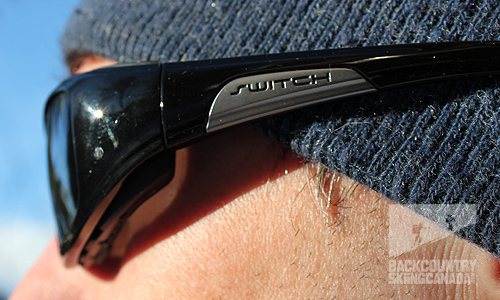 The Switch Vision Pathfinder Sunglasses come with two sets of eycups, the activity guard and the climate guard. 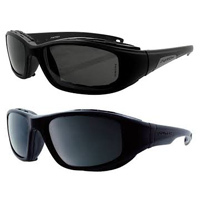 Below you can see the activity guards on the frames of the Pathfinder sunglasses. Below are the climate guard eyecups installed. 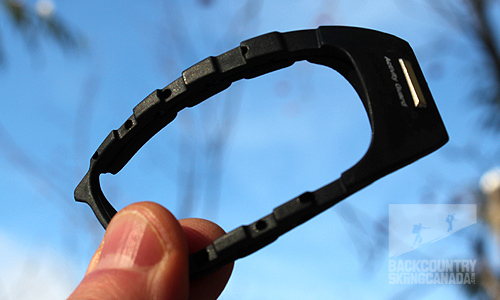 The retention strap is elastic so it cinches tight to provide a good seal between you and the switch vision sunglasses. It needs to be said up front that my face is narrow and my head small (56 cm or 22” in diameter, which is on the low end of the scale for hat sizing. In other words it can be difficult to find a pair of adult-sized glasses that fit well. I also have a high nose bridge so, in the case of the Pathfinders, they didn’t sit on my face well. Therefore, for the purposes of this review, I primarily wore the Stormriders because they have a smaller frame and, by tightening the headband as far as it would go, they were relatively snug. That said, both sets of glasses were comfortable thanks to the padded nose piece, flexible arms and soft rubber of the eyecups. Eventually the snow fell and I had the opportunity to utilize the Climate Guard eyecups for the Switch Stormriders. My first foray with them to the local ski hill was on a sunny day and I was happy to have the polarized lenses. When I reached the top, I popped out the Activity Guards and put in the Climate Guards (a process that took about 25 seconds) and again tightened the headband as far as it would go around my toque. As with my bike ride, my eyes experienced a light bit of tearing on the way down but again I attribute this to my own facial features rather than the glasses. What I did appreciate was not having my bulky goggles along for the ride. A few days later I had the chance to really test the Climate Guards when I pitched head first into some fresh snow. 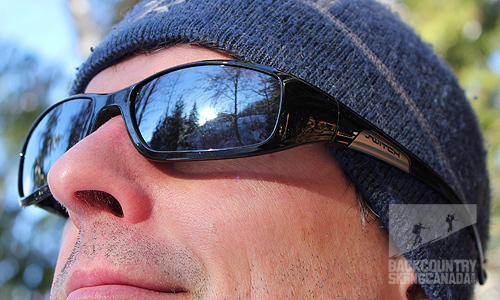 The eyecups worked incredibly well and I didn’t have any build-up of snow behind the lenses at all. Nor did the magnets fail or the frames bend out of shape. 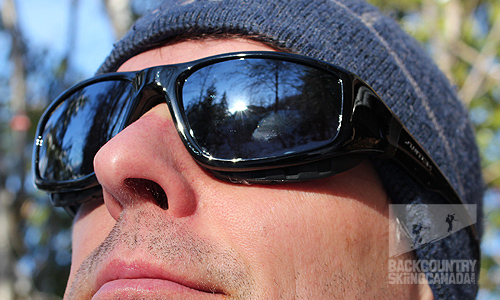 The Switch Vision sunglasses are indeed “All Terrain Eyewear” as its tagline states. I’ve now used the Switch Pathfinders while skiing, mountain biking, fat biking and walking around town and in each case they’ve performed extremely well. 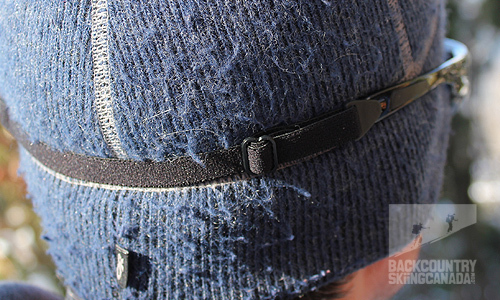 They’re comfortable and fit over my toque or under my ski helmet and bike helmet easily. The black colouring makes them fashionable and, during one foray into town, I popped off all the eyecups and the headband and just wore the basic frame, which was also comfortable. And they’re durable yet light enough that they don’t leave marks on my nose bridge after prolonged wear. The only downside of the Pathfinders and Stormrider sunglasses is that the lenses aren’t interchangeable as well. During my first day skiing with them, the clouds eventually rolled in and the light became very flat making it difficult to see obstacles with the bluish-tinted lenses. It would have been great to not only swap out the eyecups but to be able to pop in some rose-tinted lenses as well. But I’m assuming that technology is in the works. In the meantime, I recommend trying on a pair of Stormriders or Pathfinders. In my particular case the glasses didn’t fit perfectly and allowed for some airflow but if you have a wider face than these just might be what you need to forego wearing ski goggles ever again. And, at $189.95, they’re cheaper than buying a new set of glasses and a new pair of goggles. 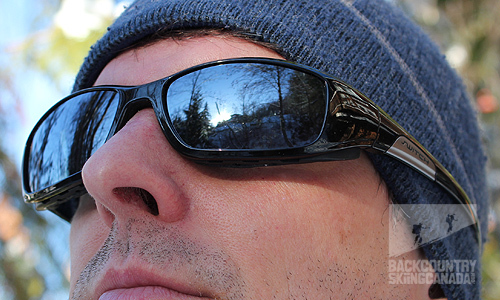 The Switch Vision Pathfinder Sunglasses. 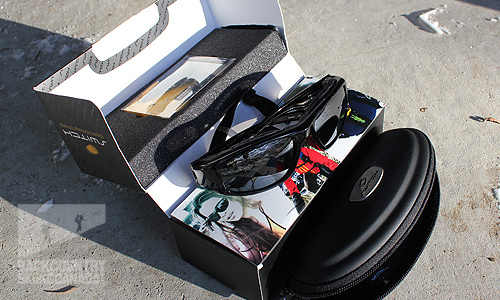 The Switch Vision Stormrider Sunglasses. 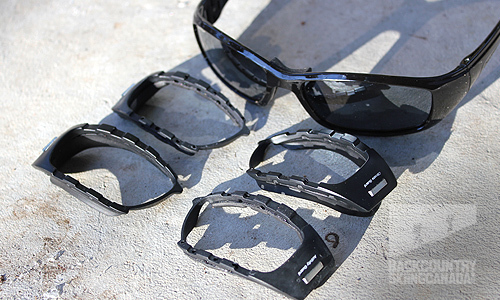 The Switch Vision Stormrider Sunglasses without the activity guard eyecups installed. Comfortable, durable and utilitarian: the Stormriders and Pathrinders are good for most sports that require sunglasses and goggles such as downhill mountain biking and skiing. The magnetic interchange system is easy to use and the Activity Guard eyecups keep out most of the wind while the Climate Guards keep out the snow and dust. They are strong yet light and can be worn around town without the eyecups in place. It would be great if the lenses were interchangeable too for those flat-light days. Also, be sure to try them on as neither style of frame fit my small face and high nose bridge perfectly.